Convenient, portable and very compact with a length of just 3.55 metres, the Comet X-Trailer is the perfect trailer mounted boom lift to tackle all your access needs for construction, signage, cleaning, electrical, maintenance and more. The Comet trailer mounted boom offers a compact length of only 3.55 metres compared to any other trailer. This compact size makes it easy to transport, manoeuvre around site and park as it only takes one car bay. The lightweight frame starting at 1,280kg also ensures the boom lift can be towed by most mid-size sedans. Hydraulic controls found in both the basket and the trailer boom are easy to use and provide great accuracy in movements. An optional self-drive system also increases operator safety by eliminating the need to manually push the trailer onsite. Hydraulic motors on both tyres allow the operator to easily drive the trailer into position using a control box. The Comet trailer mounted boom is available in various power models to suit your businesses access needs. The power options include diesel, petrol, battery electric and the hybrid model (diesel/petrol and electric). The hybrid model increases the trailers versatility by allowing it to be used both indoors and outdoors. The comet trailer mounted boom lift is available in various power options to suit a businesses needs including petrol, diesel, battery electric and a hybrid version. With a total weight starting from 1400kg, the X-Trailer can be easily towed by most mid-size sedans and only takes one parking bay when parked onsite. The X-Trailer includes an extensive range of standard and optional features including a handy self-drive system, which is perfect for positioning the trailer onsite. 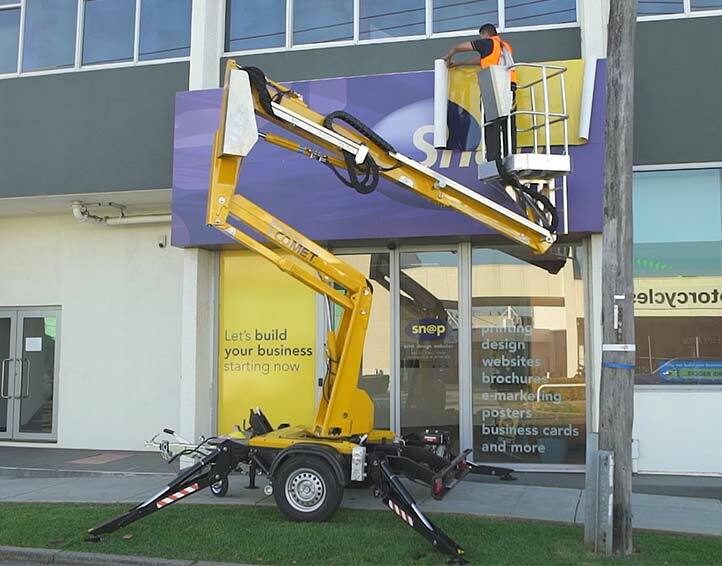 With easy to use hydraulic controls, the trailer mounted boom lift is suitable for a range of applications including signage, painting, glazing, electrical, roofing, arbor and much more. For more information download the Comet Specifications brochure. The Comet X-Trailer is ideal for tradespeople that regularly operate at height and would benefit from a compact boom lift.